You can’t afford to ignore the young people of South Africa. For one thing, there are simply too many of them: two-thirds of the population are under 35 years old. The results of the latest SA Reconciliation Barometer have some telling findings about this group: among them, that young South Africans may not experience the same kind of old loyalties to political parties shared by their parents. Politicians, watch out. By REBECCA DAVIS. The cover of the 2012 SA Reconciliation Barometer report features what will be remembered as one of the most haunting images of South Africa’s 2012 (Marikana aside): the consignment of dumped and shredded textbooks in Limpopo. 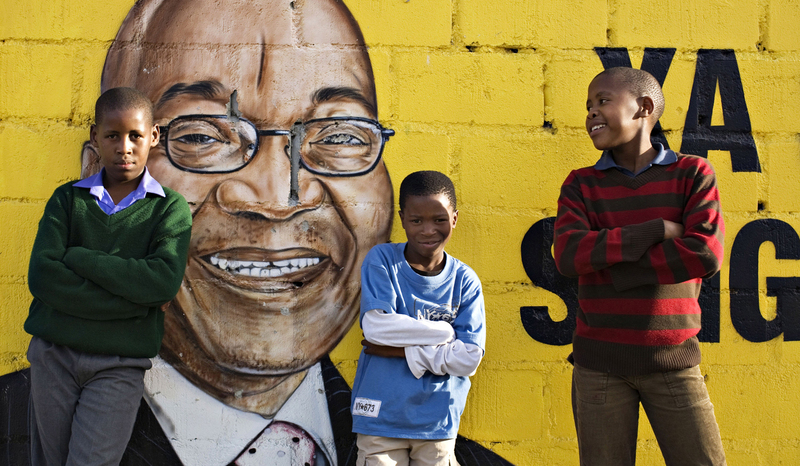 Senior Project Leader Kate Lefko-Everett described the choice of cover image as emblematic of the challenges facing South Africa’s youth, who are the focus of this year’s report. The SA Reconciliation Barometer is the product of the Institute for Justice and Reconciliation (IJR), an NGO launched in 2000 in the wake of the Truth and Reconciliation Commission to “ensure that lessons learnt from South Africa’s transition from apartheid to democracy were taken into account as the nation moved ahead”. They have been producing the Barometer annually since 2003, surveying a representative sample of South Africans on a range of issues relevant to governance and reconciliation, and extrapolating those findings to measure the mood of the nation as a whole. Because they ask respondents the same questions each year (with some minor adjustments), the IRJ says that the Barometer represents “the world’s largest longitudinal data set on reconciliation”. Lefko-Everett told the Daily Maverick that over the years of 2007, 2008 and 2009 there was a “really big decline in positive evaluations”, something she attributes to the fact that the country was going into recession and there were major uncertainties around Polokwane and the future leadership of the ANC. In 2010, as you might expect, the feel-good vibes of the World Cup left a more positive mark on that year’s Barometer. 2011, said IJR Executive Director Fanie du Toit, was “not a particularly good year for reconciliation. Arguably, 2012 was even worse.” This year, he pointed out, is a particularly interesting one because South Africans born in 1994, the advent of democracy, attain their voting rights this year, amounting to what du Toit termed “a new political force unleashed on the scene”. With the next national elections around the corner in 2014, you can imagine that strategists for political parties should have a beady eye fixed on this year’s Barometer findings, as they provide potentially valuable insights into where South African youth situates itself politically. The title of this year’s report – “Ticking Time Bomb or Demographic Dividend” – represents what Lefko-Everett says are two common, but opposite, conceptions of South African youth which recur in our political discourse of late. “Ticking time bomb” views the youth as a liability: frustrated, disaffected, largely unemployed – youth unemployment is up to 70%. “Demographic dividend” sees the youth as “cash-in-hand for the future,” to quote Lefko-Everett: a rich pool of potential waiting to have their talents channelled. But the IRJ’s report seeks to make the point that such binaries are both inaccurate and unhelpful. “Likening youth to ticking time bombs cannot but inspire fears of volatility, impatience and lawlessness,” the report concludes. At the same time, though, the Barometer contains some depressing evidence that South African youth may be “overly optimistic about their economic prospects”. Managing these expectations, without resorting to cynicism, will be a difficult task for leaders to face in the near future. The report also suggests that politicians need to take cognisance of how young people view themselves, their place in the world, and the way they view institutions, if they wish to win their votes. Lefko-Everett quoted a revealing comment made by ANC national chairperson Baleka Mbete in February, where she characterised the ruling party as an “edifice, something solid, something huge, something that has been there for some time…sometimes you feel sorry for people who come in and rush in and they want to make a difference, they want to get on to lead – it doesn’t work that way, especially with a hundred-year old institution”. The 2012 Barometer found that 58% of youth would consider joining a different political party, with 53.1% of white youth up for the idea compared to 59.7% of black youth. This is much higher than the respondents who believed it was better not to vote than to change political parties – a total of 36.2% of the youth. Almost two-thirds said that the prospect of joining a political party where they would be in the racial minority would not put them off. When it comes to confidence in institutions, the youth think that the Constitutional Court tops the pops, gaining a 68.8% confidence rate. Young South Africans also have a fair amount of faith in the legal system in general, with 66.9% of respondents expressing confidence. Confidence in national government is by some measures curiously high, at 66.2%, though the least faith is held in local government, at 49.8%. It is interesting, here, to note that levels of confidence in institutions are quite different between black youth and other race groups. For instance, 70.5% of young black South Africans report quite a lot of confidence in the Presidency, whereas just 40% of young white South Africans feel the same way. In general, the report finds, “black youth and adults are more likely to indicate higher levels of confidence across all of the institutions than other groups”. Why this would be the case is unclear, as black youth and adults are often the hardest hit by, for instance, service delivery failures. Lefko-Everett suggested that one possible reason might simply be to do with greater familiarity with institutions: when you are more dependent on an institution, you have a greater stake in its success. Privileged white kids may view the government as something remote and hostile because they don’t need government institutions as much. Lefko-Everett also suggested that people are more likely to express confidence in institutions where they see themselves better represented. However, the youth are not afraid to stand up for their rights – sometimes aggressively. The Barometer found that a startlingly high 19.4% of youth – almost one in 5 – had participated in a violent or destructive protest over the past year. This was higher than the adult figure, at 15.9%. Nonetheless, the report finds that “young people do not seem markedly less compliant with the rule of law than their parents’ generation”. 43.6% of young respondents felt it was “alright to get around the law”, as compared with an only slightly lower 41.7% of adults. Another interesting, and potentially worrying, feature of this year’s survey has to do with white youth, and particularly their attitudes to economic redress for apartheid’s legacy. 53.9% of black youth agree that broad-based black economic empowerment is an effective way of ensuring black participation in the economy, while only 35.4% of white youngsters agree. Even fewer white youth agree that employment equity policies have succeeded in creating a representative workforce – 23.6%, as opposed to 38.7% of white adults. By contrast, 49.1% of black youth believe that employment equity is succeeding. This trend is also seen in other areas. White youth were the demographic most likely to disagree with the idea that apartheid was a crime against humanity. 27.7% of white youngsters didn’t feel that was the case, as contrasted with 14.8% of white adults and 13.0% of black youth. White youth also disagreed more with the idea that “many black South Africans are poor today as a result of apartheid’s legacy”: 38.0% of them didn’t agree with that, while only 16.0% of black youth feel the same way. Some 99% of white youth agreed with the idea that “SA should forget about apartheid and move forward”, although this notion was actually popular across races and ages: in total, 66.7% of South Africans agreed that it was time to put apartheid in the past. White youth also “demonstrated particular opposition to the idea that government should still support apartheid victims, far more so than white adults”. What are the lessons we can draw from the Barometer? For one thing, political parties may have to work harder. Old family loyalties are less likely to guarantee the youth vote than they have been in the past: the report suggests that it is untrue that in South Africa “party loyalty is static and consistent and that voters are unwilling to change their partisan allegiance”. In other words, everyone’s vote is worth working for – especially as electoral participation may also be on the decline. The report suggests too that “South Africans may in fact be staying away from the polls altogether in greater numbers than ever before”.